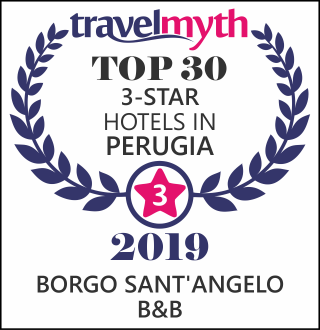 Hotel Borgo Sant’Angelo – Albergo Diffuso, is situated just a few steps from the historic town centre, in the old narrow lanes of Gualdo Tadino. A romantic three star hotel offering bed and breakfast, to cater for clients who want to discover the surroundings in a region such as Umbria, rich in history, nature and places steeped in tranquillity. Just a short distance from the hotel there is the source of the spring water Rocchetta, but there are also other centres of international renown such as Assisi, with the places where St. Francis lived, or Gubbio, Perugia and Spoleto, between spirituality, art and nature. with common characteristics, such as a feeling of discretion and a restrained elegance heightened by natural materials such as wood. Exposed wooden ceiling beams, headboards recycled from old wooden shutters, furniture in arte povera style and floor tiles of Umbrian terracotta, make this residence for tourists a little jewel. Every bedroom is large, with bathrooms with hairdryer, spacious shower and other facilities such as minibar, free WiFi, safe and LED TV. Some rooms also have air conditioning, although the climate is pleasant even in the summer months. Some rooms are suitable for entire families, whilst others are ideal for couples, especially those with four-poster bed. Borgo Sant’angelo offers all the amenities of a modern 3-star hotel, with bed, bed and breakfast, half board, full board, parking nearby, and Wi-Fi service free for guests in all rooms and in the public areas. Intimate and comfortable. Perfect for 2 people. Refined and charming decor, extremely comfortable from the large double bed to all furnishings. With an individually controlled air conditioning system. Equipped with a very large bathroom, is designed to give cosiness, comfort, and elegance to an entire family, and it can accommodate up to 3 children. All rooms are very romantic, cozy and comfortable, with attention to the smallest detail. Some are equipped with individually controlled air conditioning. The view enjoyed from each one of the rooms come from a terrace projected towards the hills and mountains covered with green, and in winter you can also admire the snow-capped peaks. The common areas regarding the “Sala della Storia” or “Sala della Cultura” (Hall of History or of Culture), give a sense to the placement of a hotel of this type. It is an attic room where there are many symbols in furnishing that take all visitors back in time: the wooden bookcase where there are writings of famous authors, both of past and contemporary, and old photos of places and village life. The “old kitchen” is the meeting place for guests and it is where they’re enjoying a healthy and hearty breakfast buffet, prepared with all-natural and biologic ingredients, such as organic herbal teas, cakes, tarts, and biscuits made by hand, and also the scent of freshly baked croissants. Even here, the furnishings speak of tradition and authenticity, mixed with modern touches such as flat LED TV, and antique touches such as the laces at the sideboard. The garden-terrace, with wicker furniture and white umbrellas, is ideal to have breakfast outside in all relax. The reception is not just a welcoming area, but also have a small bistro to enjoy a drink, a homemade liqueur, or a delicious coffee, while the car can be safely left in the covered parking situated at 50 meters away.